Rival Gaming proudly announced the release of their brand new farm themed video slot titled Windy Farm and the game promises a spectacular return once the wind start pointing in a winning direction. Windy Farm is a 5 reel video slot offering 50 paylines and based on a comical farm-life theme where it is possible to enjoy huge rewards from the free spins bonus round. The new Rival game features an average RTP of 95.7% and the low/medium variance slot offers a jackpot reward worth 1,500 coins. Windy Farm Features - Grab your Hats! This Rival software powered slot will have you rreaching for farm goats, chickens, horses, and bulls who wave hello as you look for lucrative combinations as a result of other important symbols such as doors, potatoes, and a horsebox. Windy Farm is flawlessly suited for additional rewards and highly enjoyable especially when you get to grab the bull by the horns in the very rewarding free spins bonus round. Expanding wilds increase your chances to win big as well as your spinning enjoyment and the light hearted background soundtrack could get you in the mood to stroll for much longer down the farmyard. Betting options starts from a minimum of $0.01 and during the free spins feature, seven free spins could offer a surprisingly good show of bonus funds. Slots Capital Casino invites all players to come and experience the brand new video slot for free, all players get a special no deposit bonus worth $10 on the brand new game and the $10 need to be used within 60 minutes from claiming it. To claim the bonus, simply visit Slots Capital Casino now and redeem the bonus by quoting bonus code: WINDY FARM. New members can also take advantage of a welcome bonus rewarding initial deposits with a free 300% bonus by using bonus code WINDY300. Slots Capital Casino members enjoy an array of monthly bonuses including the free Friday tickets that works on losses across 7 days and high rollers who have net losses of $1,000 or more during the time period could earn a free ticket to the value of $125 maximized to a cashout maximum of 3,125. The free Friday tickets are subject to 25x wagering for slots, scratch cards, and keno. Arriving at the farm gets you greeted by goats, horses, chickens, and bulls plus other important symbols include barn doors, potatoes, tomatoes and a horsebox. 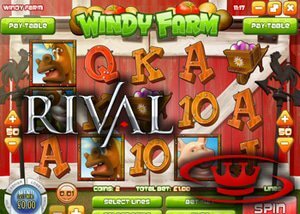 If you are in the mood for collecting wins then Windy Farm is perfectly suited and additional wins can be enjoyed from the directionally expanding chicken wilds as well as the grab the bull by the horns free spins bonus round.